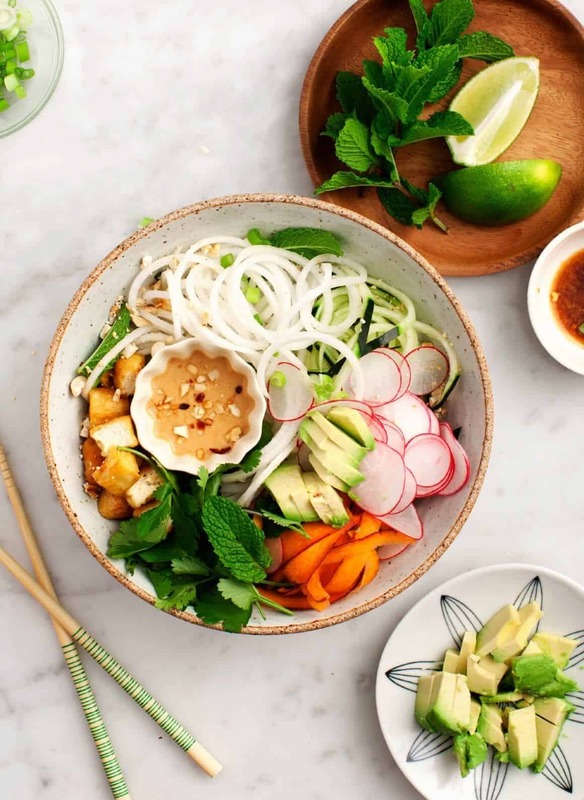 Healthy daikon "noodles" are tossed with cucumber, carrots, herbs and avocado with tamari-lime and creamy cashew sauces. Vegan & gluten free. I’ve made zucchini noodles a whole bunch of times (here and here, to name a few). Zoodles seem to be all the rage, but have you tried “doodles”? 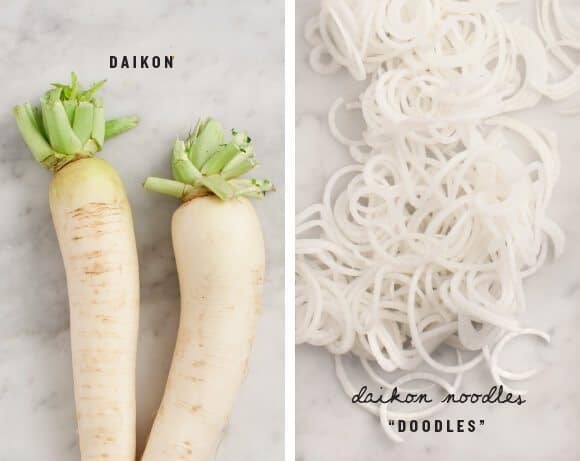 Doodles (that’s what I’m calling them) are noodles made out of daikon and they’re awesome. They’ve got a little bit more bite to them than zucchini noodles and I find them to be less watery. I love how they look like rice noodles, yet these noodles are all vegetable. To go along with the daikon noodles, I made these bowls with cucumber, carrots, radishes, tofu and fresh herbs. These are all bahn mi vegetables, so this is somewhere between a deconstructed banh mi and a noodle bowl that I get all the time at Elizabeth Street Cafe. With avocado, of course. 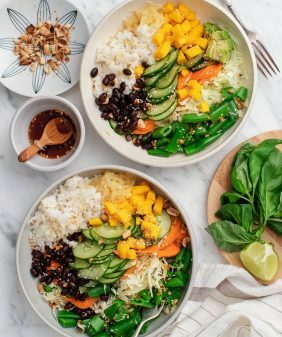 Serve these bowls with a bright, tangy sauce. This one is made with lime, rice vinegar and tamari – it’s salty in that good fish-sauce-esque way but without fish sauce. I also made a creamy cashew sauce to serve on the side. I know, two sauces sounds like extra work, but I just mixed some of sauce #1 with cashew butter (you could also use peanut butter), and voila – 2 sauces. The first sauce is very light, and the creamy cashew sauce is rich, so they work together nicely. I’ve tried a few spiralizers and I’m really enjoying the Inspiralizer. It’s sturdier and easier to store than the Paderno. I highly recommended it if you want to get into veggie noodling. If you can’t find daikon, you can use zucchini noodles. This recipe would also be great with cooked rice vermicelli noodles. 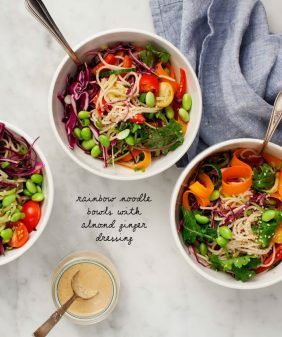 I’m a huge fan of veggie noodles – love this recipe! And the sauce sounds so delish! I’ve never tried cooking with daikon before! I’m going to go check my local grocery to see if they have it! 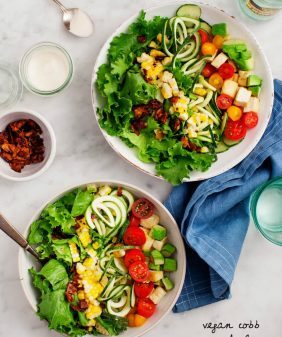 Great use of spiralizer! I just bought one and will def try this! yu-UH-ummmmm! 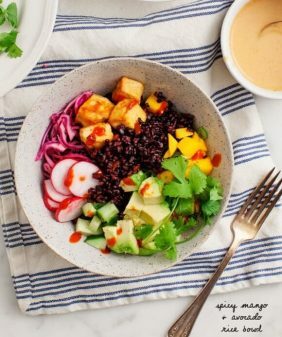 It’s ridiculous how much I want to be devouring this gorgeous healthy bowl right now! Absolutely gorgeous! Thanks for the shout-out and I can’t wait to make this at home!! 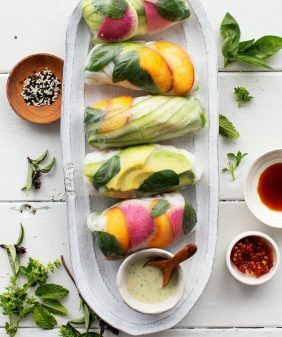 Love the idea of a deconstructed bahn mi! I’m sure my mom would really appreciate this. I LOVE daikon, so I was excited to see it in the title of the blog post. I’ve used daikon in miso soup, salads, and things like that, but I’ve never thought of spiralizing it. I’ve been thinking about getting a spiralizer and the people I’ve talked to swear by it, so I think I’m going to jump on the spiralizer craze. Haha! This was so delicious! I went back for seconds and thirds. This was terrific! 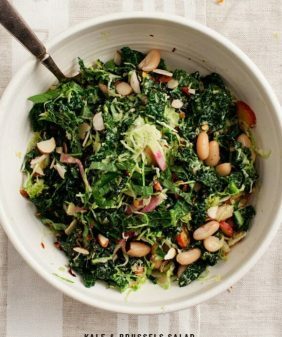 I have spiralized zucchini and sweet potatoes, but this use of daikon was light and perfect in this recipe. Made this today – it was FANTASTIC! Absolutely delicious. Thank you so much. Forget to rate it. Definitely will be a repeat meal. So good! So healthy and delicious – thanks for sharing! By the way, the correct spelling is banh. Seriously addicted to daikon radishes after trying g this recipe. I’m so glad you liked the daikon noodles! Do you think switching the lime for lemon would make a huge difference? hmm, I’m not sure, I think it could be fine, but I do think lime would be better in this case. I tried it anyway and it was still really delicious! But I could see how the lime would really enhance it. Thanks for the recipe!